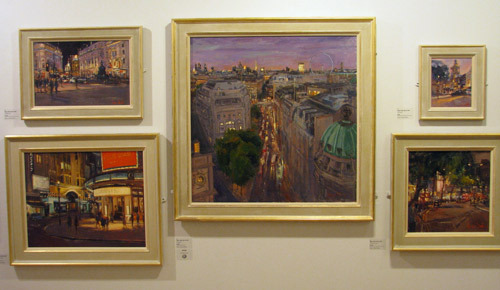 The 124th Annual Exhibition of the Royal Institute of Oil Painters opened today at the Mall Galleries and continues until 18th December 2011. 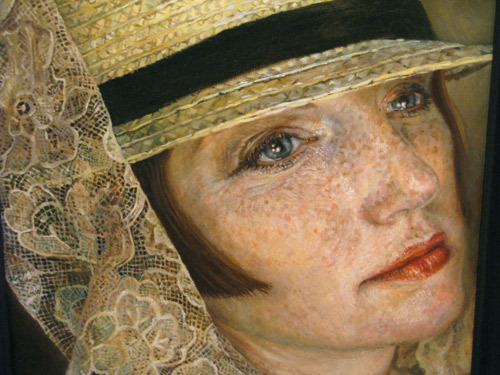 The show is largely figurative within the realism/impressionism range with a range of subject matter across portraits, landscapes and still life. 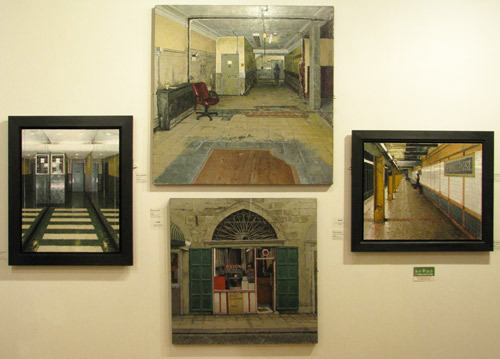 There are 243 paintings in the main part of the exhibition. 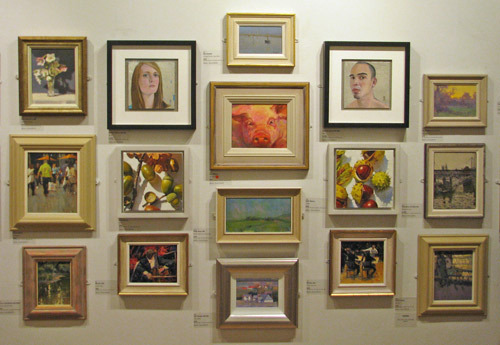 Plus a further 19 paintings in the Winsor & Newton Young Artists section. I understand there were about 700 paintings submitted to this open exhibition by both UK and international artists. 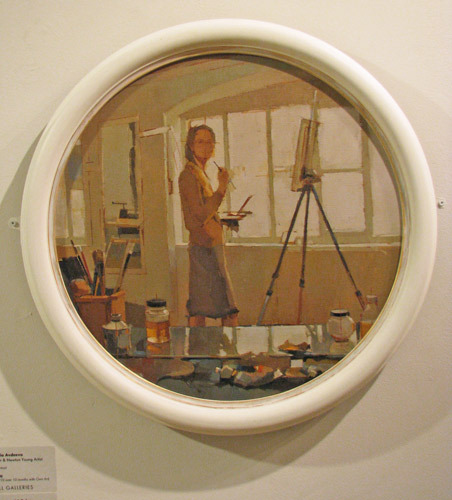 You can read more about the painters who won prizes and the ones who caught my eye below. I was at the Private View yesterday and managed to catch up with Adebanji Alade (Adenbanje Aladi) who now has Provisional ROI status and a portrait in the show - which sold yesterday at the PV. 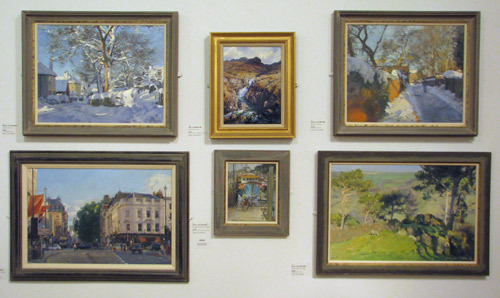 We also share an enthusiasm for the paintings by David Curtis of which more anon. I wonder if this means smaller paintings by non-members have a better chance of being selected? Below is the wall underneath the bookshop where I found a lot of non members work. 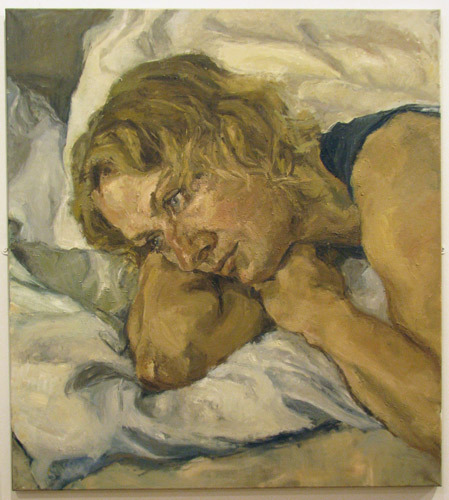 Natalia Avdeeva's painting very much reminded me of William Coldstream and the plumbline painting technique. Every item in the painting had been very precisely plotted as to centre and angle. The palette and control of the tonal range was also rather splendid. 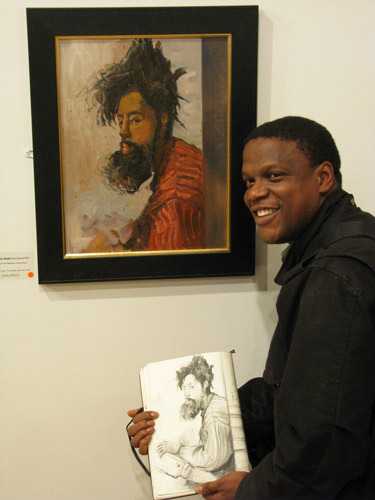 Both Adebanji and Sophie had portraits selected for the exhibition - and both were excellent. Johnny Morant had three paintings selected - and I'll be featuring his aerial landscapes on The Art of the Landscape in the near future. 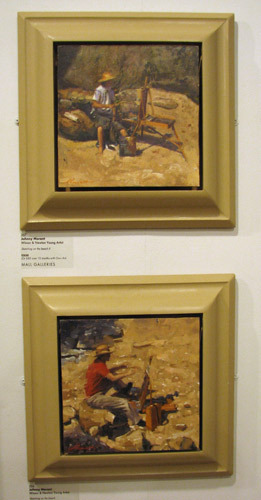 His other two paintings were excellent oil studies of plein air painters sketching on a beach. I particularly liked Linda Meaney's bright and almost joyful paintings of Conkers and Acorns. Linda is a prime example of somebody who gave up her job and became a full time professional artist later in life - you can read her story here. I can readily understand why her paintings sell well. Adebanji and I had a long discussion about David Curtis's landscapes which we both admire. They seem very realistic and yet when you actually look at them closely you begin to realise there is a huge repertoire in terms of mark-making and painterly brishwork. 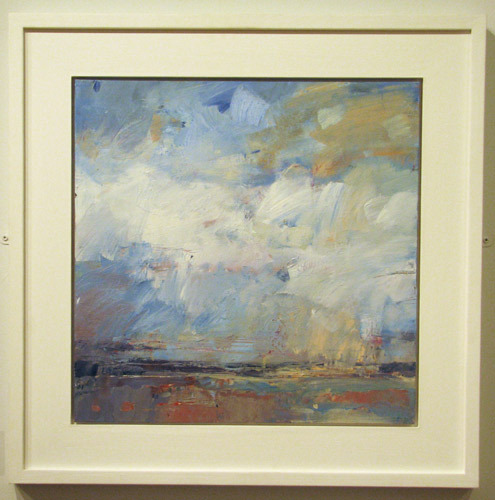 I also really liked his painting of wind swept pines above Sleights which I admired a lot. 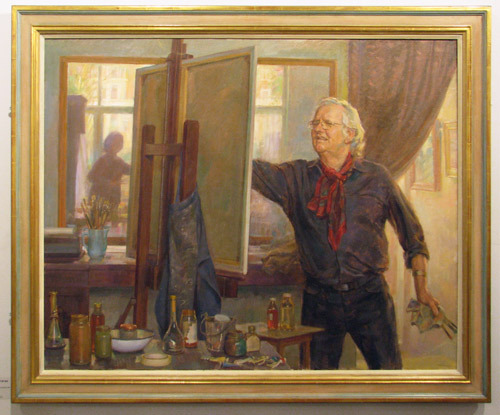 What I hadn't realised before is that his paintings don't tend to include black or very dark darks - and yet there appears to be a huge tonal range. It's quite a skill! I was also much amused by the painting at the top of this post - of two members of the society painting one another. Why don't we see more of these? There are various art events during the course of the show (but I'm struggling to find a link with details). These include a demonstration by Roger Dellar on 15th December from 2-4pm. My apologies, I'd forgotten you had 4 works in as a Provisional ROI. I'm trying to think where they were and whether I have a photo of them. Were they grouped together? Katherine, those figures by Luis were absolutely beautiful (wish I could afford to buy one!) and I think he'd sold at least one of them on the night. Deservedly so too. My paintings were spread out but the little plein air sunrise study is on the top right of the second picture in your post. Managed to sell the one of the punts at Magadalen bridge (Oxford) which was a great bonus. The others were in the east gallery. I thought Michael Portillo gave an excellent speech. The plans for adding windows to the east gallery sounds like a great idea! I got there later as I was going on to the PV for the Landscape Photographer of the Year at the National Theatre in the evening and didn't want to have to cope with the crush at the time of the speeches and be on my feet for too long. Feet are playing up again at the moment so I have to sit down straight away when they start twanging! It worked out nicely - pleasantly populated but not too many people by the time I got there! GREAT POST Katherine! !Thanks so much for the mention and that fabulous picture you took! Yes David, Luis Morris figures were a delight to behold! Thanks for the great review, a joy to read.